If you’ve got a fairly recent battery guzzling phone then you’ll know how annoying it can be to be out and about and running low on power. And after a couple of years of charge/discharge a lot of phones struggle to make it through the day on a single charge and are sealed so you can’t replace it, could an external battery be the answer? 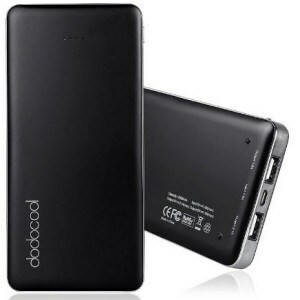 Dodocool have come up with a simple solution, the Dodocool 12000mAh Portable Power Bank. As the Power Bank is an external battery you don’t need to worry if you’re mobile is sealed, you just plug your phone (or mp3 player, camera, tablet etc) in to the Power Bank and it starts to charge. The Power Bank is nicely styled and bears a passing resemblance to an extra large iPhone. There are 3 connectors at the top of the Power Bank, two are full sized USB connectors and are used to charge your devices via standard USB cables, one is a micro USB connector and is used to charge the Power Bank. Depending on what you’re plugging in this battery should be large enough to give you 3 – 5 full charges, with lights on the front indicating how much charge is left in the Power Bank. The only minor downside to such a battery is the additional weight you’ll be carrying around. It takes a bit of getting use to if you pop it in your jacket pocket, but it wouldn’t be especially noticeable if you were to carry it round in a bag/briefcase/laptop folder.